Indonesia's environment and forestry minister says Leonardo DiCaprio "lacked complete information" when he criticised the destruction of rainforests. The Oscar-winning actor took to social media last month after a visit to a protected national park. But Siti Nurbaya has said the current government is "working hard" to protect the environment. "We are fixing the problems of the past decade," she said. Nurbaya added it was "rather unfortunate" that DiCaprio had not, she claimed, obtained comprehensive information about issues such as deforestation in Indonesia. The minister said the government was making progress in prosecuting companies that violate environmental laws and had created an inventory of areas at risk of deforestation. Last week, an immigration official said DiCaprio could be banned from returning to Indonesia. "We support his concern to save the Leuser ecosystem," said Heru Santoso, spokesman for the directorate general for immigration at the law and human rights ministry said. 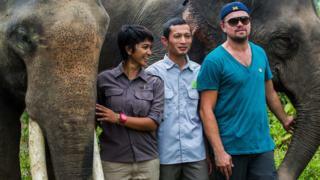 DiCaprio visited the Mount Leuser National Park in northern Sumatra last weekend. The actor criticised palm oil plantations for destroying the country's rainforests and endangering wildlife. He expressed concern on his social media accounts about species whose habitats are threatened. "The expansion of palm oil plantations is fragmenting the forest and cutting off key elephant migration corridors," the actor posted on Instagram. He described the area as "a world-class biodiversity hotspot", adding: "Palm oil expansion is destroying this unique place". Palm oil is a type of vegetable oil that comes from the palm fruit, which is grown on the African oil palm tree. After DiCaprio's visit, the immigration director-general Ronny Sompie told daily newspaper Republika: "If there are statements that discredit the government and the interests of Indonesia, he could be deported," pointing out that the actor's tourist visa limited him to "excursions" only. Slash-and-burn practices destroy huge areas of Indonesian forest every year during the dry season. Critics argue the practice creates a haze that pollutes neighbouring countries and causes considerable economic losses. The fires are often set to clear land for agriculture, including palm oil plantations. Siti Nurbaya said she appreciated that DiCaprio was trying to raise awareness of the issue and that his social media comments were posted with good intentions. "My view is that DiCaprio's concerns are both sincere and substantial, and he has certainly acted in good faith," she said. Last year, DiCaprio donated more than £9.5m ($13.5m) to environmental organisations. "The destruction of our planet continues at a pace we can no longer afford to ignore," he said at the time.